Singaporeans always lament that there is nothing to do in this tiny little island. Therefore, although we look forward to Fridays, we would be struck by that overwhelming sense of loss when we wake up on Saturday mornings. 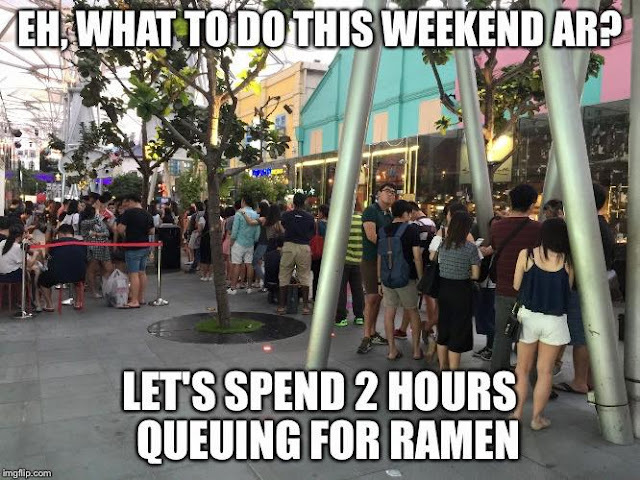 Yeap, that was the queue when I went on a Saturday dinner time. And we braved blood, sweat and numerous curious looks from clueless angmo that were strolling around Clarke Quay. If they spoke Singlish, they would have called us "siao eh". 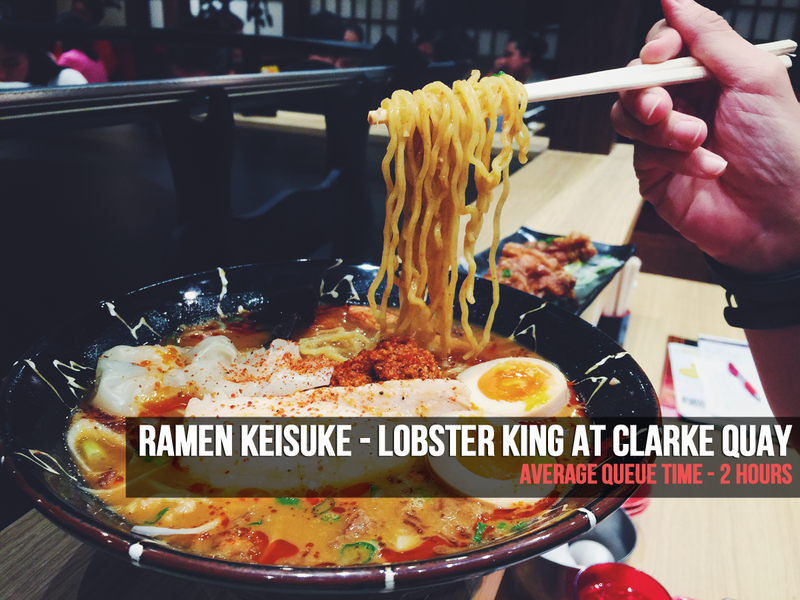 If you love ramen, you would not be a stranger to Ramen Keisuke, where its chain of outlets have already spawned in numerous places around Singapore. Before this, my favourite was the outlet at Tanjong Pagar (Tonkotsu King), where I would make a visit there at least once a month. If you do not know, both their beansprouts and their boiled eggs are free-flow. So technically, you will never walk out a Ramen Keisuke outlet hungry, unless you don't like eggs/beansprouts. Evilbean pro tip: Mix the eggs with that mayonnaise for the ultimate fattening but shiok experience. At the Lobster King outlet, the decor are much more elaborated as compared to Tonkotsu King. There is a giant Japanese gong in the middle of the restaurant, a long samurai sword and numerous Japanese lanterns lighting up the place. And here comes the food. Well, not only was the tartar sauce homemade, they also make the sauce live, in front of you, when you order this dish. Despite my love for rich and creamy stuff, this sauce got 'jelak" really fast for me. The chicken was awesome though - crispy on the outside, tender on the inside. "SO HOW WAS THIS, EVILBEAN?" said the eager you. I read mixed reviews about this, so here's a Evilbean pro tip: order the SPICY MISO Lobster Broth ramen. It's not spicy at all, trust me. With the Spicy MISO version, I found the broth to be really delightful - sweet, rich and hits all your umami senses, while the bowl was chocked full of ingredients, which means you will never run out of things to pair your noodles with. Conclusion: It's #4evilbeans. YOU CAN NOW GO JOIN IN THE CRAZINESS. I felt that the true star, however, was not the ramen. Instead, it was the inconspicuous Fluffy Omelette Rice that won my heart (or belly) over. I promise you will fall in love with this omelette rice. Imagine sweet curry gravy generously slathered on top of a layer of egg omelette... hidden underneath is a bed of fluffy tomato rice that is both warm and comforting. OH MY GOD I AM DROOLING AS I TYPE THIS. YOU HAVE TO ORDER THIS! Overall, I think this would be my new favourite ramen haunt once the insane crowd die down. In the meantime, I shall just go back to my 10 minutes queue at Tonkotsu King (Tanjong Pagar) for my monthly ramen fix. On second thought though, if I am writing this post, wouldn't it drive more people there?! WHAT THE BEAN AM I THINKING?! Related: One of the BEST EGGS BEN IN SINGAPORE @ LOLA'S CAFE! This post was fully paid and queued by myself. DON'T TAX ME. SGD 22 for lobster ramen? I'm sold! I'll be there next time I go to Singapore. I just came back from Hokkaido recently and miso based broths are what they're known for. The noodles is much thicker than the Kyushu ramen that I'm personally used to too, but it was good. I'm also a huge fan of omurice. I first had it in Japan too, awesome stuff, it's deceptively good. It looks simple but it tastes like awesome. Cheers!